Oshkosh home care providers believe dog ownership offers many benefits to seniors. Research indicates that pets provide a calming effect that lowers blood pressure. However, when considering a canine companion for a senior family member, some breeds are better than others. Before your loved one chooses a dog, keep the following six breeds in mind. The friendly and happy little dogs mature to a weight of 18 pounds. They are easy to train and willing to please. The terriers have a medium energy level and the only health concerns include the possibility of developing lens luxation. These adorable little dogs weigh a mere 12 pounds when fully grown. Their lush coat does require brushing a couple of times per week. Overall, the spaniels are quiet and do not need a lot of exercise. The only potential health problem involves possible patellar luxation or knee displacement. Weighing 13 pounds at maturity, the Lowchen breed also has a long coat that requires some upkeep. Otherwise the animals are intelligent, alert and easy to train. Similar to spaniels, the small dogs might also develop knee problems. These beauties have a thick snow-white coat, but they are considered low maintenance and do not require an excessive amount of grooming or exercise. They tend to be very loyal to their owners. Outside of potential knee problems, the Spitz have normal health concerns pertaining to diet and age. Although these dogs appear to be a smaller version of a Husky, these dogs aren’t even related to the sled dogs. They weigh 16 pounds when fully grown and are very protective of their human parents. The potential for developing knee problems are a major health concern. These little dynamos mature to a weight of 8 pounds. The dogs are lively, affectionate and eager to please. Weekly grooming and potential knee problems are the only drawback to owning one of these compact cuties. 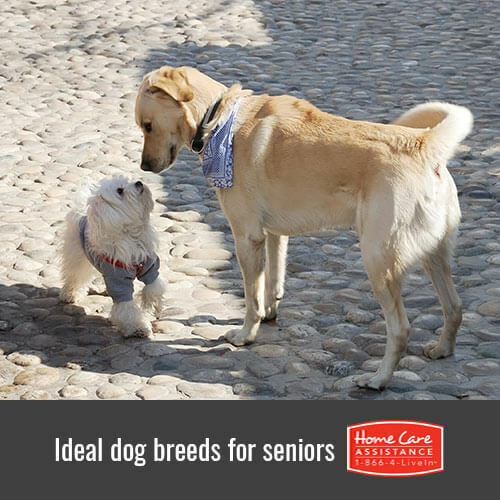 Seniors also benefit from having human companions, as well. Contact Home Care Assistance at (920) 710-2273 today to learn more about our premier home care services. Our flexible live-in and hourly caregivers in Oshkosh offer seniors emotional support and assistance with everyday activities in order to boost overall wellbeing. Our friendly Care Managers are readily available to answer all of your questions and customize a care plan for your loved one.